The Queen and the Duke of Edinburgh are celebrating their 70th wedding anniversary this week. They married on 20th November 1947 at Westminster Abbey. Queen’s wedding dress that had 10000 pearls imported from America was designed by Norman Hartwell. Last week Buckingham Palace released 4 portraits marking the historical event. Queen Elizabeth II is the first Monarch marking this milestone. The portraits of Her Majesty and The Duke were taken by British photographer Matt Holyoak of Camera Press, in the White Drawing Room at Windsor Castle earlier this month. In these new photographs, The Queen and The Duke were pictured in front of a platinum-textured back drop. Royal Family shared the some of the moments The Queen and The Duke of Edinburgh have shared together over the last 70 years. On their anniversary the Queen gave Prince Philip a unique wedding present. Her Majesty has appointed His Royal Highness the Duke of Edinburgh to be a Knight Grand Cross of the Royal Victorian Order (GCVO). Awards in the Royal Victorian Order are made personally by The Queen, for services to the Sovereign. Unlike the previous milestones, this year the couple celebrated their big event with close 140 family and friends at Windsor Castle. Embed from Getty ImagesDuchess of Cambridge Kate was seen leaving Kensington palace and arriving at Windsor Castle with Prince William and Prince Harry. For the event it seems Kate was wearing the elegant DVF Zarita lace gown. We first saw the gown at Royal Variety Performance in 2014, then at a friend’s wedding in the same year. Recently gown made reappearance at for the Anna Freud Gala dinner earlier this month. 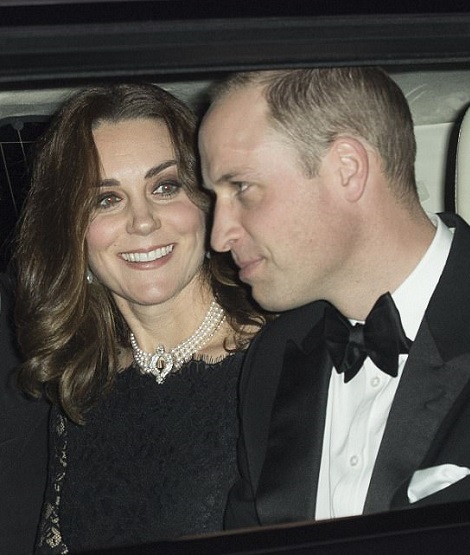 Highlight of the Duchess look was the Four Row Japanese Pearl Choker, an elegant piece of jewel on loan from Queen. It was commissioned by the Queen from a set of the finest cultured pearls presented to her by the Japanese government. Embed from Getty ImagesHer Majesty’s Jewel Vault described the jewelry as ,” The necklace includes four rows of pearls with a central diamond clasp in a curved shape, each side including three rows of diamonds that join at the top and bottom with marquise diamonds. She made her first state visit to Japan in 1975; the choker was in use by at least 1982. The Garrard book posits that it was inspired by the Queen’s new daughter-in-law at the time, and she did notably loan the piece to the new Princess of Wales during a state visit from the Netherlands in 1982. It is only occasionally used by the Queen, in whose collection it still remains”. Duchess paired the Necklace with Princess Diana’s Collingwood Pearl earrings.